The world economy could be $300 billion poorer after the failure of the latest Trans-Pacific Partnership (TPP) talks in Hawaii. With time running out to salvage a deal, the U.S.-led trade pact risks becoming stalled indefinitely, handing the initiative to China’s rival grouping and reducing the prospect of much-needed productivity gains. 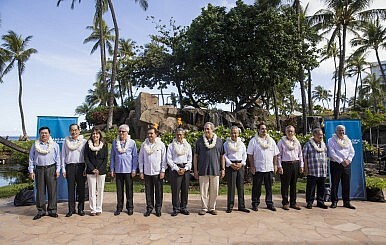 Hopes of a breakthrough were high when negotiators from the 12 TPP nations met Tuesday in the tropical U.S. island state to seek agreement after five years of talks. Comprising Australia, Brunei, Canada, Chile, Japan, Malaysia, Mexico, New Zealand, Peru, Singapore, the United States and Vietnam, the grouping encompasses 40 percent of world gross domestic product (GDP) and a quarter of global exports, with a successful TPP potentially representing the world’s biggest trade accord in more than a decade. Yet after much fanfare and encouraging initial reports, on Friday the TPP’s trade ministers ended their negotiations, releasing a joint statement that only committed to further talks. The ministers announced that “after more than a week of productive meetings, we have made significant progress and will continue work on resolving a limited number of remaining issues, paving the way for the conclusion of the Trans-Pacific Partnership negotiations. The Hawaii talks reportedly stalled over a range of issues, including auto, dairy and sugar exports, along with a proposed monopoly period for next-generation drugs. After claiming earlier that a deal was “98 percent complete,” Australia’s Trade Minister Andrew Robb blamed the United States, Japan, Canada and Mexico for frustrating a final agreement. “We have made progress on sugar and dairy but we haven’t concluded,” he told ABC News. However, according to the Oriental Economist’s Rick Katz, the negotiators have only the first two weeks of this month to conclude a deal, otherwise it will be “legally impossible” to bring the pact to a U.S. Congressional ratification vote this year. “The Japanese know, for example, that the United States needs to ratify the TPP during 2015; otherwise, it will be hard to get it ratified until the next presidential term and that could spill over into 2018, not 2017, and possibly not be done at all,” noted Peter Drysdale, editor of the East Asia Forum. While an APEC leaders summit is scheduled for November, by that stage the U.S. presidential election campaign is likely to overshadow trade talks. Adding to the potential stumbling blocks are Canada’s general election, which is scheduled for October, while Japanese Prime Minister Shinzo Abe faces re-election as Liberal Democratic Party president on September 30. While Japan and the United States would account for two-thirds of the total estimated GDP gains, exports of member nations would also grow by some $440 billion. “Within a decade, the trade deal could also become a framework for meaningful bilateral engagement between the United States and China,” the Washington-based institute said. Further adding to the case for the TPP, the International Monetary Fund’s (IMF’s) managing director Christine Lagarde has noted that 2015 could mark “the fourth consecutive year of below-average trade growth,” with a slowdown in trade liberalization a key factor. “Multilateral negotiations have stalled, and regional trade initiatives have not matched the transformative effect of…the North American Free Trade Agreement,” she said in April. The TPP could raise U.S. incomes by 0.4 percent, or $77 billion a year, while Japan is “keen to use the TPP to inject greater competition into its low-growth economy,” Lagarde said. The TPP has been described as the vital “third arrow” of Japan’s “Abenomics,” with the Japanese leader reportedly using the external pressure to help leverage open the nation’s sheltered agricultural sector. Politically, the TPP has been described as the centerpiece of U.S. President Barack Obama’s famed “Asia pivot,” helping cement U.S. economic as well as political and military leadership in the region. While the United States already has trade pacts with most of the individual TPP members, an agreement would add Japan and other Asian trading partners, update existing U.S. free trade agreements and also “demonstrate to Asian partners that U.S. engagement in the region has an economic focus, alongside the obvious military dimension,” according to the Peterson Institute. For the U.S. pivot, the latest failure represents a major blow, Kehoe argued. “The breakdown of TPP talks is a huge geopolitical loss for the Obama administration and a gift to emerging rival China. The economic piece of the Obama administration’s much-hyped “rebalance” to Asia is now in disarray, as an ambitious Beijing plans an alternate Asia-Pacific trade deal,” he said. China aims to conclude negotiations this year on its proposed Regional Comprehensive Economic Partnership (RCEP), which would link the 10 ASEAN member nations with Australia, China, India, Japan, New Zealand and South Korea, accounting for a third of global GDP. While the RCEP talks are far from completed, the TPP’s latest failure has put the trade ball firmly in Beijing’s court. For Washington, losing this latest game in the battle of Asia-Pacific ascendancy could be extremely damaging, while the rest of the world watches billions of dollars in potential economic gains disappear into the hidden hands of protectionists. Forging the Trans-Pacific Partnership: An Insider's Take‘Free’ Trade and the Sovereignty SqueezeTrans-Pacific Partnership: Time for Some American HustleTrump Killed TPP. What's Next For Trade in Asia?Could the TPP Actually Divide Asia?